BMW’s MINI brand will launch the next generation MINI Convertible in March 2016. The launch follows new models in 2004 and 2009. After 12 years of sales success, BMW claims the car remains the only premium soft-top four-seater convertible in the small car segment, and the UK continues to be its largest market worldwide. New features include a fully electric roof that is quieter and smoother than the previous model, a fully integrated rollover protection system and more rear space. 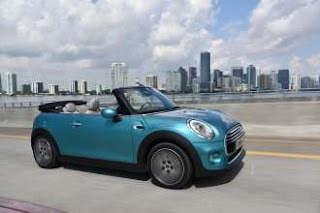 The latest MINI Cooper Convertible (above) and Cooper D Convertible are 3,821 mm long, with the MINI Cooper S Convertible 3,850 mm long. All models are 1,727 mm wide, 1,415 mm high and have a wheelbase of 2,495 mm. The new car has the latest generation of EU6-compliant engines are installed under the bonnet. The petrol engines inside MINI Cooper Convertible and MINI Cooper S Convertible – 1.5-litre three-cylinder and 2.0-litre four-cylinder respectively – feature turbocharging, direct fuel injection with centrally positioned injectors, variable camshaft control on the intake and exhaust side (double VANOS) and fully variable VALVETRONIC valve control technology. On the 1.5-litre diesel three-cylinder engine in the MINI Cooper D Convertible, there is turbocharging with variable intake geometry and common rail direct injection. As for meeting Euro 6 emissions requirements for the three-cylinder diesel engine in the light of recent events at Volkswagen AG, engineers at MINI say they use exhaust gas recirculation and Nitrogen oxide storage catalytic converter technology. The nitrogen oxides produced in lean operation are stored as nitrates inside the storage catalyst. As these exist partly as NO, they must first be oxidised into NO2. In cyclically occurring fat phases during which sufficient reducing agents (H2, CO and HC) are made available at a low oxygen concentration (<1%), the stored nitrates and reducing agents oxidise into N2, H2O and CO2. The typical operating range of an NSC is between 150°C and 500°C, thereby covering a broad diesel engine characteristic up to just below full load. One considerable advantage of a NOx storage catalyst is, according to MINI engineers, that thanks to its location close to the engine, “highly efficient exhaust gas after-treatment performance” is available immediately after cold starting the vehicle. The aftertreatment described by MINI as a 'NOx storage catalyst' is referred to more commonly as a lean NOx trap (LNT). Its catalytic action requires significantly more precious metal than is found in a self-regenerating diesel particulate trap or any other catalytic exhaust cleansing device. As such it is expensive for initial installation and particularly expensive to replace, should the catalyst be 'poisoned' through inadvertent use of diesel fuel with a too-high sulphur level.